It’s no doubt that Ron Howard makes great films. His movies have won numerous awards and have starred the biggest names in the business at one point or another. That being said, I would go on to say that Howard’s films tend to be forgettable after the first year or so and begin to collect dust in people’s movie collections. There are a few exceptions with ‘Apollo 13‘, ‘Willow‘, and ‘Parenthood‘, but the rest of his resume tends to be forgotten and not watched as much as people claimed when it first came out. Unfortunately, this is the case with his new movie, ‘Rush‘. People will love it at first, but nobody will mention it next year. CLICK HERE TO READ MY FULL REVIEW OF ‘RUSH’!!! And of course Hemsworth is the ‘Thor’ like god we all want him to be. He is deeply charasmatic, funny, and devestaintly handsome. Don’t worry girls, you will get to see him naked more than once. However, there is a pain behind all the charm and beauty of Hunt, as his widely publiscized marriage didn’t work out and friends turning on him. One of my favorite scenes was when Hunt brutally and deservedly attacks a member of the press for asking Lauda how his wife can look at his ugly face now that he is burned. 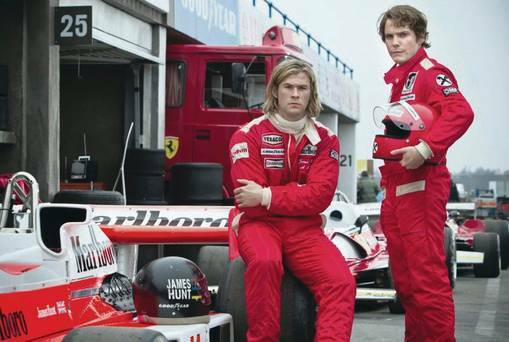 ‘Rush‘ is a solid film with two brilliant performances from Hemsworth and Lauda. I expect decent returns at the box office, despite this not being a ‘Fast and Furious‘ type of film. This is worth the price of a movie ticket. This entry was posted on Thursday, September 26th, 2013 at 9:44 pm	and is filed under Film, News. You can follow any responses to this entry through the RSS 2.0 feed. You can skip to the end and leave a response. Pinging is currently not allowed. « Rosario Dawson is Joining Aaron Eckhart in Horror Franchise ‘Incarnate’!! !